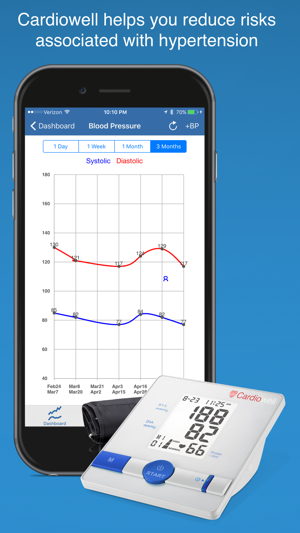 Cardiowell is the world's first digital therapeutic to reduce the risks associated with hypertension. 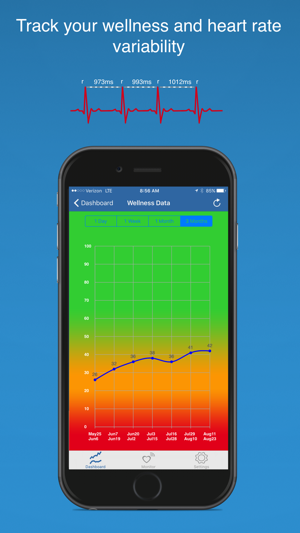 Cardiowell allows you to improve your health and wellness by developing awareness of breathing and heart rate activity. Cardiowell measures small changes in time between each heart beat (heart rate variability) and notifies you when you are under stress. Cardiowell supports a variety of heart rate monitors and blood pressure devices to allow for self-monitoring. 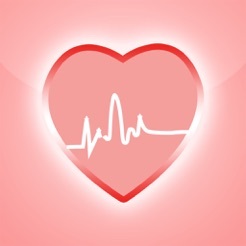 Use a supported heart rate monitor and blood pressure device for maximum benefit of the App. We believe that through self-awareness you can be empowered to improve your health and have a longer life. Measuring and monitoring your blood pressure by itself may not reduce your blood pressure and improve your health. Cardiowell allows you to be an active participate in your health. Cardiowell encourages you to become mindful of your breathing and practice breathing at 6 breaths per minute. Breathing at six breaths per minute has been shown to lower blood pressure, reduce depression, improve sleep and reduce symptoms of irritable bowel syndrome while improving wellbeing. Cardiowell helps you become aware of factors that cause you stress and with feedback, coaches you to breathe better and adapt to your situation. By setting up heart rate and heart rate variability (HRV) auditory, tactile, and/or visual notifications, you become aware when your health is being affected by poor breathing and stress. 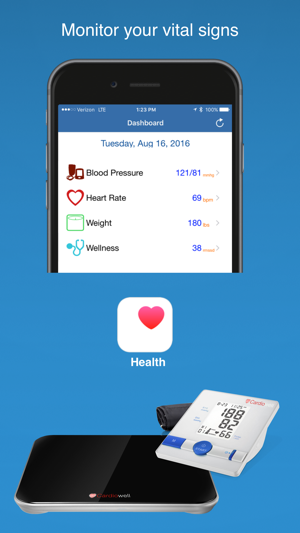 Cardiowell integrates with AppleHealth so you can monitor your blood pressure, pulse, and weight, to understand how healthy breathing can improve your wellness. -Set notifications on Apple iPhone & Watch allowing you to receive subtle nudges whenever you are not breathing properly. 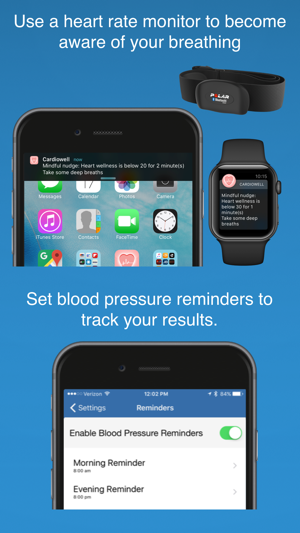 -Track your blood pressure and set reminders. -Monitor changes in blood pressure, weight, pulse, and wellness. 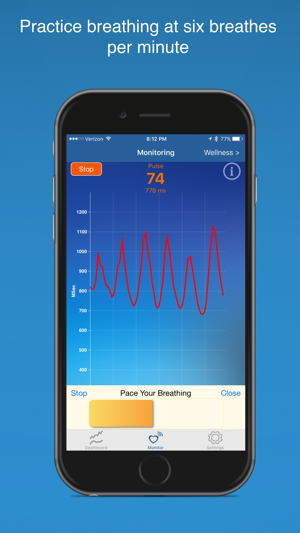 Important: This App requires blue-tooth low energy heart rate monitors like the Polar H7, or H10 and many other BLE heart rate monitors to allow for stress monitoring and behavioral feedback. Apple Watch only allows for receipt of Wellness nudges and reminders. Heart rate from the Apple Watch is not supported. It also supports the Cardiowell blood pressure and weight scale. But you can always manually add blood pressure values and import blood pressure data from their party Apps using AppleHealth in order to monitor your health. Please note that Cardiowell is not supported on the iPad. *Cardiowell is a general wellness improvement solution to reduce the risks associated with hypertension. The Cardiowell solution is indicated for use only as an adjunctive treatment for high blood pressure together with other pharmacological and/or non-pharmacological interventions. Cardiowell recommends that you do not modify your hypertension treatments without the advice and consent of your physician. Fixed bug when monitoring in the background. Requires iOS 11.0 or later. Compatible with iPhone and iPod touch.